The Champagne Classic is a Group 2 race for two-year-olds held on a Saturday in mid-May at Doomben Racecourse on Doomben 10,000 Day during the Brisbane Winter Racing Carnival. Offering $175,000 in total prize money, the 1200m sprint for juveniles is run at set weights and is a traditional lead-up to the following month’s Group 1 JJ Atkins (1600m) over the Eagle Farm mile. The feature race at the meeting is the Group 1 Doomben 10,000 (1200m), with the Champagne Classic the major support act on the Doomben card. The two-year-olds racing in the Champagne Classic usually back-up in the Group 2 BRC Sires’ Produce Stakes (1350m) a fortnight later before possibly going on to contest the JJ Atkins on Stradbroke Handicap Day. The last Champagne Classic winner to continue on and win the JJ Atkins was Pressday (2010). He and Sizzling (2012) both won the Champagne Classic – BRC Sires’ – JJ Atkins treble known as the Queensland 2YO Triple Crown. In 2014 Brazen Beau won the Champagne Classic before running second in both the BRC Sires’ Produce Stakes and JJ Atkins that winter. The next edition of the Champagne Classic runs on Saturday May 11, 2019. The official Champagne Classic 2019 Results & Finishing Order will be provided below once the race takes place at Doomben Racecourse on Saturday May 11, 2019. Champagne Classic odds are usually led by two-year-olds with proven ability in Group class races. Sydney raiders with Group winning form or that were Group 1 performed during the Sydney Autumn Racing Carnival before coming to Queensland often feature high up the Champagne Classic betting markets. Youngsters that ran well at the Gold Coast in the Ken Russell Memorial the month before, who have winning form over the 1200m distance and that are proven at the Doomben track are also usually kept safe in Champagne Classic betting by the bookies. The Champagne Classic 2019 odds on the JJ Atkins-bound two-year-old winter gallopers will be provided below the week of the race so stay tuned for access to the best Brisbane racing markets. The Champagne Classic field attracts the winter’s best two-year-old hopefuls from both local Brisbane stables and interstate. The bulk of the Champagne Classic field continue onto the BRC Sires’ Produce Stakes with the chance to step out over 1600m in the JJ Atkins in June on Stradbroke Handicap Day. 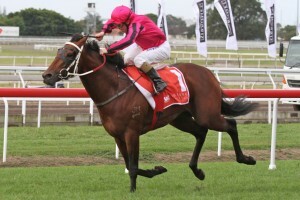 Sizzling (2012) won the Champagne Classic – BRC Sires’ – JJ Atkins triple during the Brisbane Winter Racing Carnival. Photo Credit: Daniel Costello. Youngsters in the Champagne Classic field come via a variety of different lead-ups, but the Sydney visitors may have contested something like the Group 1 ATC Sires’ Produce Stakes (1400m) at Randwick in April during ‘The Championships’. The major Queensland lead-up into the Champagne Classic meanwhile is the Group 3 Ken Russell Memorial (1200m) at the Gold Coast in late April. Recent winners of the Ken Russell Memorial – Champagne Classic double include Sizzling (2012) and Gold Edition (2006). Champagne Classic nominations close the Monday before the race with the final field and barriers out on the Wednesday. The official Champagne Classic 2019 Final Field & Barrier Draw will be published below on the Wednesday leading up to Doomben 10,000 Day so check back to see the two-year-olds that make the line-up. The Champagne Classic Nominations 2019 are out the Monday of race week attract two-year-olds out of Queensland lead-ups like the Ken Russell Memorial and Listed Dalrello Stakes (1200m) in late April. The official 2018 Champagne Classic Nominations are now out featuring 18 two-year-olds including smart filly Sizzling Belle racing for the first time since her Golden Slipper ninth, the Ben Currie-trained Dalrello Stakes winner Mishani Hustler chasing fourth win on the trot and the lightly-raced Godolphin galloper Dynamited having just his second career start after a win on debut last November. The Champagne Classic form guide features all the must know info on the runners in the field including saddlecloth numbers, barriers, jockeys, trainers and lead-up form. Looking for two-year-olds with previous Group race experience or winning form over 1200m is important when doing the Champagne Classic form. The Champagne Classic form has also stacked up in better Brisbane two-years-old races in recent years including the JJ Atkins. Recent Champagne Classic form shows the Ken Russell Memorial at the Gold Coast as well as the summer’s Magic Millions 2YO Classic have provided a number of winners of the event now run on Doomben 10,0000 Day. A link to our comprehensive Champagne Classic 2019 Form Guide will be provided for punters below the week of the race. Champagne Classic tips include looking for two-year-olds with previous Group winning form over the 1200m in either Sydney or Brisbane and for the stand-out juvenile of the season in the mix. Locals have a strong record in the race, so promising juveniles with good lead-up form in Brisbane make a good bet as well when doing the Champagne Classic tipping. Popular betting doubles during the Brisbane Winter Racing Carnival include the Champagne Classic – BRC Sires’ Produce Stakes, as well as the BRC Sires’ and the JJ Atkins. Our Ladbrokes’ insider Champagne Classic 2019 betting tips and Doomben racing selections on the Group 2 sprint will be detailed below the week of the race so stay tuned for the two-year-olds to back and sack in the early winter feature. Champagne Classic results in recent years show an even mix of local and interstate-trained two-year-olds. Some famous Champagne Classic winners in the past decade include Gold Edition (2006), Court (2008), Pressday (2010), Sizzling (2012) and Brazen Beau (2014).